Hop 'n' Pop Till You Drop is the first level of World 4 found in Yoshi's New Island. 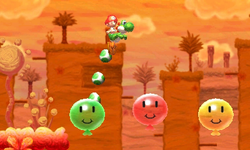 Yoshi starts the level in a desert-like area with bubbles containing enemies and moving platforms, with some balloons and the next area nearby. Here, a Checkpoint Ring awaits, along with a trail of moving platforms and bubbles, one of them containing a key. The key opens a door which leads to an area with a Mega Eggdozer and the Goal Ring. Korean 사뿐하게 두둥실 계곡을 넘어! Sappunhage Dudungsil Gyegogeul Neomeo! Lightly Cross the Valley!